Take, one Doctor, mix with an old fashioned typewriter (with additional spell-checker – he’s not stupid) and a vivid imagination sparked by a long and boring period where nothing much seems to be happening. Add to this a touch of a bossy Pendorian’s interference, a very warped sense of humour, and leave until barely half-baked. 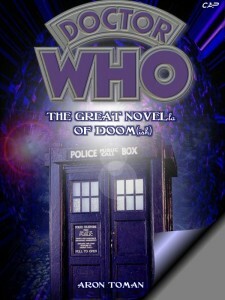 End result – an insane attempt at a novel written (mostly) by everyone’s favourite Time Lord. May Rassilon help us all. Written on the spur of the moment with nothing to guide it, the Doctor decides to churn out 50,000 words, involving as many old friends, enemies and places he can think of. Will Destina and the Computer have a surreal and suspicious Gallifreyan-automaton relationship? Will Frobisher be inexplicably murdered, requiring a trip to the underworld to retrieve his spirit? Will Astra and the Doctor ever resolve their argument of whether 50,000 words is actually a novel or a novella? Featuring just about everybody from anywhere (and then some), this adventure was written partly to celebrate Doctor Who’s 40th Anniversary, but mostly as part of NaNoWriMo, an international event where millions of budding (and insane) authors attempt to write a 50,000 word novel within the month of November. Written by Aron Toman, this novel was uploaded on a weekly basis between November 8, and November 27, 2003 as it was written, totalling 52,576 words. No planning was been done for this story, and the quality obviously reflects that of a first draft written on the fly. Flying-by-the-seat-of-your-pants writing – there’s nothing like it!